Paddle-fest in Buena vista, CO. The Festival Booth is the ideal set up for large events and multi-day festivals, with upwards of 4,000 people. Designed to handle constant all-day demand and quick order times. The set up/tear down takes time and space. Requiring a minimum footprint of 10' x 20' with a nearby location to park a 14' back stock trailer. Local access to water and electricity are extremely helpful. This set up is available for your large event May - September. The Food Truck is a versatile option for smaller and/or single day events. Being a fully self-contained unit there is very little set up time and we require no on site electricity or water (although they do help as generators can be obnoxious). The Truck is also more adaptable with the menu and we are able to adjust our offerings to your events tastes. Eddy Out @ Whitewater Wraps can be found during summers in downtown Salida. *Truck is available year round. **Also available to Rent weekly or monthly between Sept and April. Whitewater Wraps Menu is designed for the Festival- Booth set up and we like to stick with what we do best to facilitate volume of patrons. However, with the Food Truck at smaller events we have the freedom to design a menu that suits your events specific needs. ~ three to an order. Perfect festival snack. we are the home of the 1lb burrito. the first choice of outdoor enthusiasts . We think you'll agree our nachos are a step above the rest. using chips made from brewers grain and real chili con queso. as we all know Nachos are for sharing thats why we make em big! 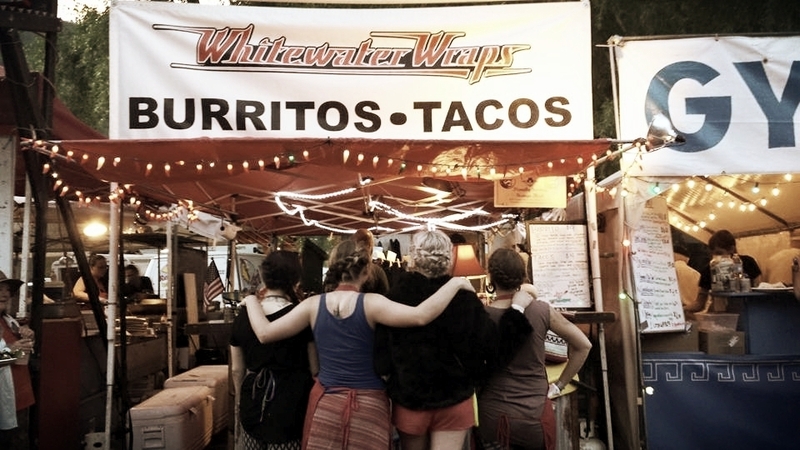 Whitewater Wraps is an events food service company specializing in Mountain-Mex style burritos. Our food is inspired by some of the highest places in the Americas. We are not only committed to providing quality locally-sourced ingredients, but also have a sincere passion for the preservation of the watersheds we've chosen to live in. We are the stewards of spring runoff and that big job requires some big fuel. Quality food is the fuel for our actions. We are proud to offer a menu that sources meats and grains from conscious Colorado farmers and purveyors. We also support the global structure and welcome imported Aji chilies from the Mountains of Peru. WW serves all meals on 100% compostable and recyclable products. Everything we make is fresh to order and we are happy to accommodate most food restrictions. Respect for fresh water is an integral part of our model. Whitewater Wraps is a proud sponsor of American Whitewater. We accomplished this through annual monetary contribution as well as providing resources to help you make a difference in our country's water supply. Visit https://www.americanwhitewater.org/ to help save some rivers! Kindness is too often an overlooked virtue. We are a company built by river guides and nature lovers. That's why we make sure that we do everything in our power to run the company and our lives with conservation and ambassadorship in mind. We'd love to take you on a river trip! At Whitewater Wraps we've made it a personal mission to approach every interaction in our lives with the guiding reminder to be kind. Amid the variables of life, we all have our moments of outward frustration, but as it was simply put in Roadhouse: "Relax and...be nice about it."